Born in 1959, Dennis chambers began dumset at 4 years old as self-taught and his public career, at 6 years old in a nightclub. 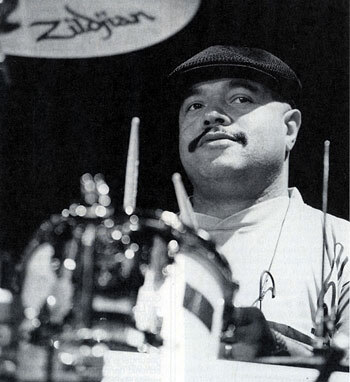 He boasts of having no school education and will learn "on the job", but claims in his instructional video "In the Pocket", the influence of Clyde Stubblefield , the first drummer of funk to make "breaks beats" and systematize the playing with "ghost notes", in 1967 with James Brown, "The Godfather of Soul". At 18, he joined the famous funk band "Parliament and funkadelic" (1978) which will be his first big success. As comfortable in funk, than in blues, than free jazz, master of the playing with alternating strokes (with the two hands and the two feet), asymmetric measures, rhythmic shifts (like the swung playing "at the bottom of the time" slowing down and speeding up on every beat, "In the pocket ") and improbable rolls with continuous passages and very fast single stroke rolls, the heel-toe in triplets in the John Bonham way, of the bass drum double pedal which he is one of the first to use with complex and super fast rolls (before metal virtuoso drummers of today), cross accelerations in independence in steps, Dennis Chambers has asserted himself in recent years as a pillar of the contemporary jazz scene (see the non-exhaustive list above). He also had the honor to play alongside Gregg Bissonette and Louie Bellson (in an improvised trio) at the first concert of tribute to Buddy Rich in 1989. Dennis Chambers offers instructional scores and videos.